The Pugmire tabletop role-playing game rules provide streamlined play and easy creation of heroic dogs. The Pugmire tabletop role-playing game rules provide streamlined play and easy creation of heroic dogs, with an emphasis on cooperation and action over competition and violence. Plus, this core book contains lots of useful information about the Pugmire world. Buy with the buttons below, or ask your local hobby store! Pugmire: Friends and Enemies is an INTERACTIVE audio drama adventure, available on Earplay! Want more information on Fetch Quest, the upcoming Pugmire cooperative card game? Click on the logo above to check out our Kickstarter! Get a free interactive character sheet for your Pugmire chronicle! Want to learn how to play? "Pan's Guide for New Pioneers" can help! Just want to try it out? "Vinsen's Tomb" will jumpstart your game! Guide's Screen, for easy access to charts while hiding your secrets. Special Pugmire dice for every chronicle. Player aid cards to enhance your Pugmire RPG experience! 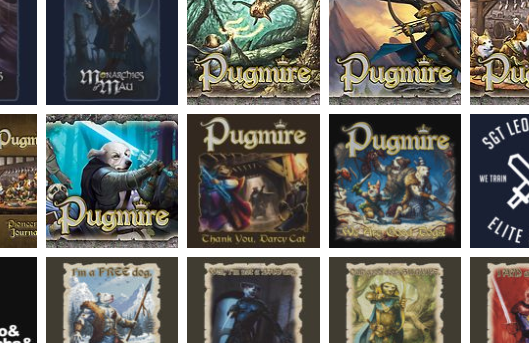 A variety of Pugmire posters for your wall! Shirts, postcards, notebooks, and more!